PROPERTY developer MK Land Holdings Bhd is seeking cheap loans from Exim Bank to develop affordable housing in northern Bangalore with India's Embassy Group. The project, with gross development value of around RM4 billion, is set to be undertaken by MK Embassy Land Sdn Bhd, in which MK Land and Embassy Group hold 47.5 per cent each while MKN Embassy Development Sdn Bhd has 5 per cent. "I hold a 5 per cent stake in the project. We have been invited by our partner Embassy Group to replicate the low-medium-cost model of Damansara Damai in Bangalore," executive chairman Tan Sri Mustapha Kamal Abu Bakar said. "The joint-venture company will buy land from Embassy Group. With that as collateral, we will borrow money from Exim Bank, at a low payback rate ... as low as 4 per cent," he said. 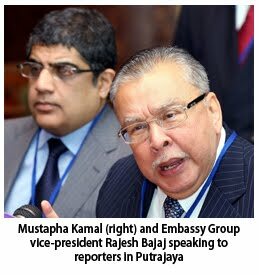 Mustapha Kamal was speaking to reporters after MK Embassy Land sealed a development agreement with NAM Estates Pvt Ltd, a unit of Embassy Group, in Putrajaya yesterday. He said the joint-venture company was buying the 185-acre site from Embassy Group at RM2.3 million an acre. The low-cost apartments will be in the range of 660-880 sq ft and priced between RM115,000 and RM175,000 each. Since the new township is 8km away from the new Bangalore International Airport, the apartment blocks will be limited to eight storeys. "We'll launch this project as soon as we receive the approvals from the authorities in India," Mustapha Kamal added.